Alchemists are those special people practising their powers to create gold and silver from ordinary metals. In this classic slot game from Playtech you will not create any of those precious metals but there are very generous pay outs that will enrich you just as much. There are 3 reels with one pay line and the coin value is set at $1.00 making the maximum bet $3.00 Dollars UK pounds and Euros are all accepted. The reels are designed as an Alchemists laboratory with different bottles of various coloured potions and features a bubbling cauldron which you can hear in the background. There are several betting options and a bonus game is included. The top pay-out is 10000 coins valued at $30,000 and is won when you trigger 3 coin symbols on the pay line. 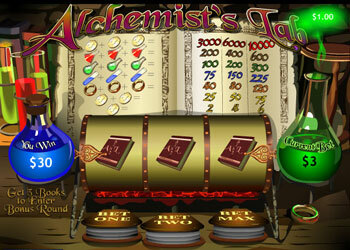 Players will enjoy the experience of the Alchemists Lab Slot and the opportunity to win big on a very well designed slot!